Linda Pirri is one of the artists that will be featured at the La Jolla Festival of the Art's 25th Anniversary this weekend. For its 25th year and counting, the beautiful and sunny La Jolla beach community will be holding its annual Festival of the Arts this weekend. 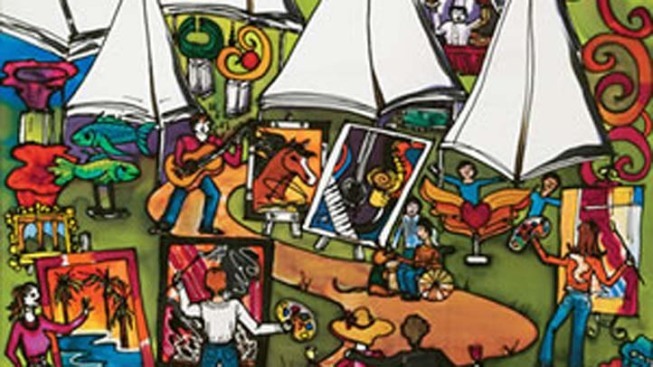 Visitors will be able to experience so many types of sensational art at this festival, including oils, pastels, sculpture, photography, water color, chalk art, jewelry, even music and gourmet food Father’s Day Weekend, June 18 -19. Nearly 200 award-winning local and national artists from the United States, Mexico and Israel will be participating in the Festival this year. There's plenty to see and do at the event as well, including visiting art galleries, listening in on live music at the main stages, and sampling several kinds of gourmet foods. Some performers on this year’s entertainment schedule include Hollywood historian Jerry Beck, musicians Fred Benedetti & Peter Sprague, and The Mar Dels, a US Navy Southwest Jazz Band. Also, Bernard Guillas from the Marine Room will be creating a meal inspired by Cara Brown’s original artwork. Classic cars will be there as well; after all, it is Father’s Day weekend. The participants of this year’s festival are more than just artists; they are staples to the San Diegan community who have discovered their love for art. Take Steve Appel, the shipyard worker for example: he creates his art by using recycled metal. Or Elizabeth Dunlop, a Junior High School teacher who quit her job after 23 years of teaching to focus on her art. And, Yangping Qi gave up being a family doctor after 20 years of practice to become a ceramic artist. This goes to show that no matter what somebody’s original intentions are in life, anybody can become an artist. Make sure to check out these passionate artists at the Festival this weekend. Every year a new artist is featured at the festival, but for this quarter century celebration, two unique artists were chosen to headline this year: Karen McGaw and Linda Pirri. Karen McGaw first participated in the La Jolla Festival of the Arts back in 1998. She is a nationally praised artist from Santa Barbara, who will be showcasing her beautiful scenic paintings of La Jolla, California, Italy, and France at this year’s Festival. In the past 30 years, she has created a reputation for herself, known for her vibrant range of color use, and elegant painting style. Linda Pirri creates beautiful works of art by mastering the antique art form called “Serti,” or hand painting on silk. Her work is featured on the Festival’s 25th Anniversary poster. Linda’s strong spirit and love for life can be felt through her style; her art personifies what the festival is all about. Posters, merchandise, and originals from both featured artists will be sold and auctioned off at the Festival this weekend. Funded by the Torrey Pines Kiwanis Foundation, the purpose of the La Jolla Festival of the Arts is to support sports and recreational programs for disabled San Diegans. Types of activities that they support include but aren’t limited to adaptive snow skiing, wheelchair road racing, camping, wheelchair tennis, and therapeutic horseback riding. The Torrey Pines Kiwanis Foundation also supports disabled veterans from Iraq and Afghanistan. Tickets are $10 per person, but if you sign up for the Festival’s newsletter, you can save $1 on admission. Tickets are available online at lajollaartfestival.org. You can pick up your tickets at will call at the Festival. This is the best art festival in all of San Diego. The Festival of the Arts is located on La Jolla’s charming cliffs that overlook the beautiful Pacific Ocean, located specifically at the University of California at San Diego campus, 8677 Villa La Jolla Drive, Suite 1144 La Jolla, CA 92037. It is never too late to become an artist at the La Jolla Festival of the Arts, or a sponsor. If you would like to become a sponsor, please check out the website at lajollaartfestival.org for more information. You also can find more detailed information on the event schedule, and view previous posters from the Festival online as well. Now get out there and do something fun and stimulating this Father’s Day Weekend by taking advantage of what the La Jolla Festival of the Arts has to offer!